Happy almost Valentine's Day! 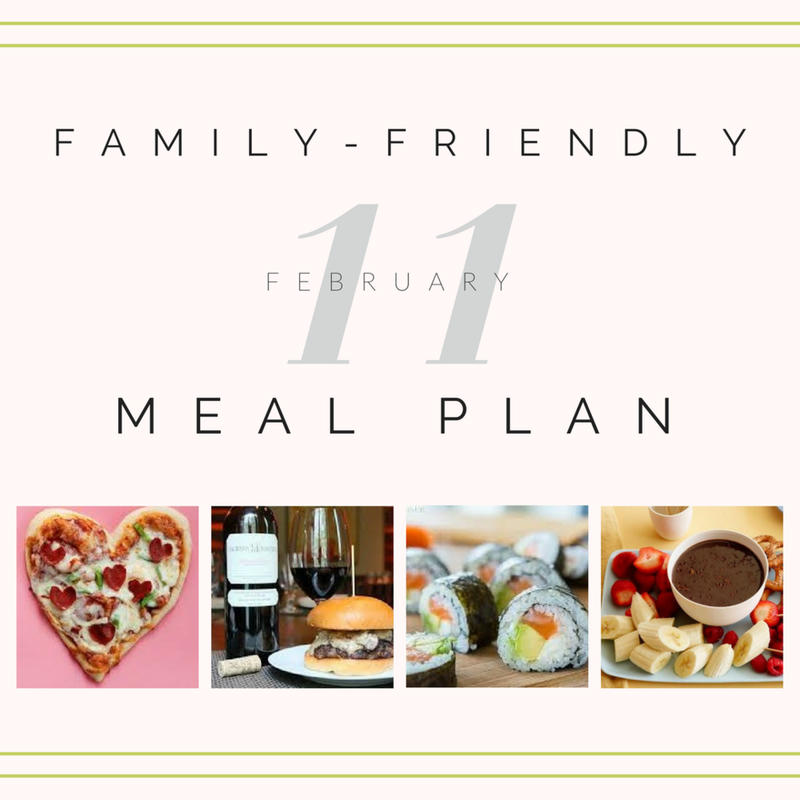 This upcoming week's meal plan is a bit non-traditional to others I have shared in one, two, three, four, five, and six in that it is focused specifically on fun Valentine's Day dinner ideas for you and your spouse and/or your whole family. I hope you will enjoy the added ideas to make this an extra-special day of celebrating with those you love. How do you do Valentine’s Day in your family? Is it a special date night out (or in!) for mom and dad, or do you involve your kids as well in doing something a bit more special for dinner? We have celebrated with our girls each year since we having kids, but I am not going to lie that I do fondly think back to our Valentine’s Days when we were married and without a worry of bed time, tantrums at the table, or a child not eating what was offered. Those were the days. These are the days. Let’s make the most of today. That’s why I have included some of my family’s favorite Valentine’s Day menu ideas in this week’s post. We use these for non-official date night ins throughout the year, but also have used some of these in year’s past. Whichever you choose, I hope this post will give you some ideas for the coming week or an impromptu date night in sometime with your spouse. Our most favorite Valentine’s Day with kids may have been our first one just weeks after Claire was born. We enjoyed fondue at leisure as we were interrupted with feedings and infant cries. It was the perfect dinner that you can make longer without an issue. It was also an easy one to prep ahead during the intermittent nap times and offered great flexibility for when it was time to cook, eat, and enjoy. We have this fondue set and love it (affiliate link). We love doing a cheese with veggie first course, then a meat or seafood with broth main course, and lastly (of course! 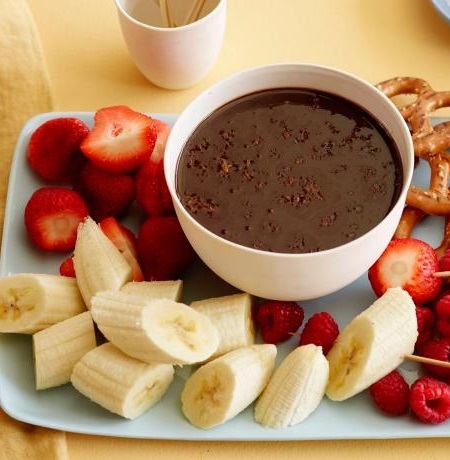 ), chocolate with fruit and/or other decadent dippers for the dessert course. If you want to order a gift that goes straight to your husband’s stomach, Fish Fixe is a fun idea. Not only would you have seafood options to use on Valentine’s Day (hello lobster or scallops! ), but you will have plenty of other fish fillets to enjoy all the days thereafter. You can sign up to have this as a reoccurring monthly order, or order one time for Valentine’s to try it out! I love that a whole fixe costs less than a traditional pre-fixe menu out on Valentine’s Day, and yet it provides several meals worth of seafood for you, your spouse, and your family to enjoy. If I left the menu up to my husband, I can almost promise it would include ahi. While it is more often something we order out versus make in, I love this poke kit for a fun and different idea to do with my husband on Valentine’s. Everything I have ever had from Vital Choice is of excellent quality, so I believe it is safe to assume a raw fish from them would be nothing less. If doing dinner with kids, they may not be into poke and/or you may opt not to offer them raw fish. If that's the case, stick with the traditional "Love it, Like it, Learning it" approach and consider including rice and edamame for them to enjoy, as well as some novelty items for the special night like pot stickers and/or mochi for dessert! This is a tasty option regardless of if you are eating with or without kids. The weekend before Valentine’s, make a family trip to your Farmer’s Market. If you have never been, this is a great excuse to head out and explore one local to you. Then while you are there, you can find some quality steak and seasonal produce for a special Valentine’s Day meal. Often, there are local bakeries too, so consider going all out and finding a fun loaf of something to add to your Valentine’s meal. One year when we were dating, my husband and I went to the running trail where we had our first date and then went to a local restaurant I LOVE that had gluten-free burgers. We enjoyed them with a nice bottle of wine (while sitting there in our running gear) and it was seriously my kind of night in a nut shell. Now, fast forward seven years and we may be grilling our own burgers with our girls, but we have for the first time splurged on becoming wine club members to a winery we like. This acts as an awesome Christmas/Valentine’s/Anniversary gift all in one, instead of us coming up with random and less-than-awesome ideas to give each other. With it, we always have a much-loved bottle of wine on hand to take a more ordinary burger-night and elevate it to something oddly romantic. This is a fun and kid-friendly option. As a kid I have very fond memories of my dad making homemade pizza dough with me on our butcher block, so this is a good way to get your kids in the kitchen for Valentine’s Day. Use a premade dough, order dough-only from your favorite local pizza joint, or make a homemade recipe (like this one). Then shape it into a small, personalized-sized heart, let each member of the family decorate their own pie, and pop it in the oven to bake. A goal of mine in 2018 is to start making sushi at home. My friend Gillian over at LaLa Lunchbox is always sharing glimpses of the rolls she makes and sends in her kiddos lunchbox, which has inspired me to do it myself. I ordered THIS SET off of Amazon (affiliate link) and followed Gillian’s How to video on the highlights reel for her Instagram stories. This is what I am challenging myself to make for our family this year as we are now officially into January and still haven’t mustered the bravery (nor energy) to make our own. What makes a "perfect pair?" In light of the upcoming holiday, I thought the following subscriber-submitted question was a timely one to highlight. Subscriber-Submitted Question: "How do you pick the love it/like it foods to go with each meal? Do you plan the meal and then add "love it" foods if there aren't any included already and even if they don't necessarily "go" with the meal? And, what if love it foods mostly consist of chips and crackers (salty, crunchy)? Would you add a few anyway? We don't make separate dinners for our kiddo, but I do want to figure out how to better incorporate something he loves (the list is small) into each meal so he'll eat something at dinnertime." Dietitian-Mom Tip: When deciding what to pair, remember it is an ongoing, ever-changing process that gets easier with time and experience. In general, I think it is fine to offer any of their love it foods at a meal, especially if/when there isn't anything else that would be a love it food at the meal. The goal however should be to use those as your starting place, not the end goal. That's why I would deter anyone from doing this consistently at every meal if there are other love it foods that could be cycled in and seemingly "make more sense" with a meal on a given night. I don't serve bread and butter every night for this very reason. I know that my girls will eat it any time it is available, but also are less likely to eat other love it and like if foods when a "filler" option like bread is available. Instead, I use this love it food as the starting place. It serves as a familiar, preferred food while they continue to get exposed to all of the other options at the meal. Then, as I see them start to accept and enjoy other options, I make the decision on whether or not to still include the bread/less nutrient-dense love it food in future meal plans when the other now like it or love it foods are also available. Make the love it food available family-style, or rather to everyone. Don't dish it as something specific to the child who "needs" it at the table. Make it a part of the meal for everyone, even if say you or your husband choose not to eat it or only take a bite's worth (as a form of role-modeling what you expect your child to do with each food offered). As soon as you find a love it food that "makes sense" with the meal, work with that and try to food chain it to find similar foods they enjoy and will eat that aren't the exact same. In doing so, you may change up the type of bread, cracker, tortilla, pita, rice or other preferred food by making one small change each time. An example is if your child loves white rice, try mixing it half and half with brown, or make it into a cilantro lime rice on Mexican night, or a fried rice with Asian food. This can help avoid anyone from getting into a rut with "my kid will only eat this one type of XYZ" while also expanding their acceptance to one food in a variety of forms. Try to begin working within the theme nights. While these are helpful for planning, they're also tremendously helpful at trying to help expose your child(ren) to culturally-relevant foods in the comfort of your own home. By expanding on the types of foods that may be offered within a particular cuisine (as shared above with the Poke bowls), you help your child to find a preferred food for any cuisine. This will give your family tremendous freedom when it comes to eating out, ensuring that there is always something each member of your family enjoys at a given restaurant or within a particular cuisine. For more ideas on what food options to pair with certain ethnic menus, download the free printable below. It will provide you with pairing ideas for the main entree, starches, veggies, and side options you could offer with Mexican, Asian, Italian, and American themed foods. Work on offering these foods at home and you will quickly find new love it and like it foods to expand what you offer with dinner at home and when eating out! Want to know what Valentine’s Day “treats” I buy and why? You can check out this post from last year for nine non-candy Valentine’s Day gift ideas! Because the menu for this week is not intending to emphasize productive, realistic everyday meal ideas for your family, but rather ones that are fun for a special occasion, my prep tips look a little different. That's why this week I can't help but emphasize to try to meal prep as a family. Even if you get some of the more complicated items out of the way on your own, special family meals like those shared above are a great excuse to get your kids involved in preparing the meal, setting the table, or even making cute place cards for each member joining in on dinner. It may not be realistic to do ALL of this for your Valentine's Day meal, but I challenge you to find at least one new or special way that your child (or spouse!) can take part in preparing for your Valentine's Day dinner. Then allow yourself and your family time to complete that task so that it becomes an enjoyable prep-step in the meal and not one of added stress and chaos. Are you making these recipes? Tag me on social media when you try a recipe from my meal plans! I would love to see what you are making and hear how it went over with your family.